East Anglia has plenty of churches which are more remote than St Mary, Akenham, but can any of them be so lonely? Here we are, just four miles from the Cornhill in the centre of Ipswich, with the flats on Whitton within sight, but we are almost a mile from the nearest proper road, and there are just two old farmhouses for company. Standing here on a narrow, muddy track through the fields, I find myself easily transported back through more than a century. I must turn my back on Whitton, one of Suffolk's biggest and most deprived housing estates. Barely a mile from where I now stand, I have seen children play in the wrecks of burned-out vehicles; any weekend, police helicopters light up the night as they track the course of joyriding car thieves. I turn my back on the houses and the distant traffic of the A14, on the little spire of Whitton's pretty parish church. And all I hear is the skylark invisible above me, the gentle rush of the wind in the hedgerow, the sound of a dog from nearby Rise Hall. In front of me stands St Mary, Akenham. Along with Rise Hall, this little lost church was the scene of one of the great ecclesiatical scandals of the 19th century, a scandal that occupied the national press for a year or more; a scandal that reached the highest courts in the land, and ultimately led to a change in the law. It is the story of a conspiracy, a tale of manipulation and persecution. Even more than this, it was a watershed in the controversy surrounding the Oxford Movement, and the irresistible rise of Anglo-catholicism. To find out what happened here, let us go back a little further, to the 1850s. The minister in charge of this parish was the Rector of Claydon, Father George Drury, one of the new breed of ultra-ritualists. 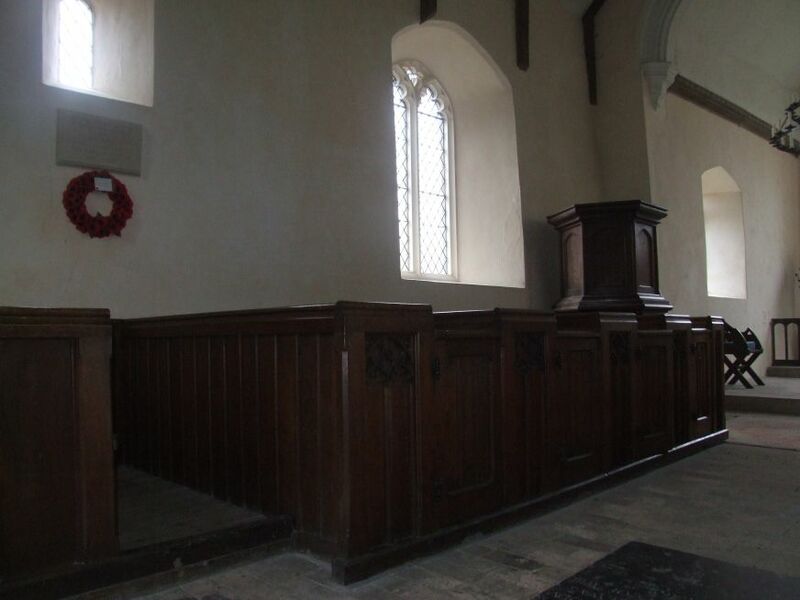 His introduction of candles and a cross on to the altar at Claydon, as well as vestments, daily communion and even incense, scandalised the local protestants, and led to his admonishment by the Bishop of Norwich. For all these things were quite illegal, of course; several priests had been prosecuted, and a few of them imprisoned, one for more than a year. Others were persecuted into breakdown, early death and even suicide. Priests like Drury were notorious at this time, not least for calling themselves Priests, a suspiciously papist word. It was not enough for a Church of England minister to be a protestant, he had to behave like one, too. And Drury's greatest crime, in the eyes of his opponents, was the establishment at Claydon of religious communities, firstly of men, and then a convent of sisters. We may well imagine the effect on a Suffolk village of Father Ignatius, the exotic monk who led the first community here, moving it to Norwich and then to Wales, where it still survives as a Catholic community on the island of Caldy. What enraged popular opinion, though, was the convent. Father Drury was accused of keeping a harem, an outrageously offensive slur in the mid-19th century. On one occasion, a local mob broke into the convent and 'rescued' a nun; she was conveyed to a lunatic asylum by order of her father, and incarcerated there until his death. Anti-catholic slogans were painted on Drury's rectory, and he built a nine foot wall around it to protect it. But Claydon is a big village, and we may presume that he found as many enthusiasts as enemies there. Supplemented by adherents from a wide area, his Anglo-catholic services at Claydon were very popular, despite constant interference from the Bishop of Norwich, who on one occasion threatened him with suspension for saying services in an unlicensed preaching house - that is to say, he celebrated communion in the convent. He was also accused of calling communion 'Mass'. This all seems very amusing today, but we need to remember that burning passions were inflamed; popular opinion, and at times the Law, were not on the side of George Drury. 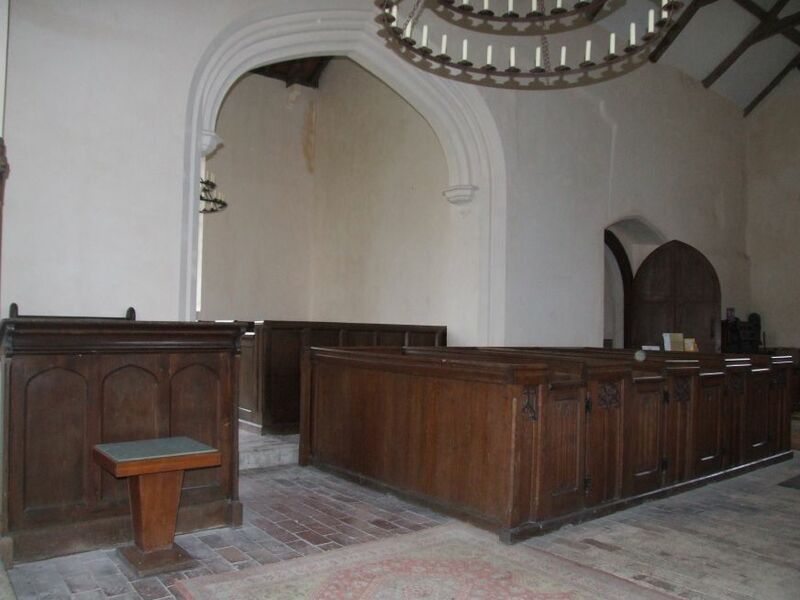 If Claydon was a busy church, then Akenham was quite the opposite. As I say, Claydon was, and is, a large village; now combined with Barham, it is virtually a small town. But Akenham, in the 19th century, could muster barely 70 souls (and a fraction that number today). More than this, virtually all the inhabitants were non-conformists, largely because the two major landowners, Mr Gooding of Akenham Hall and Mr Smith of Rise Hall, beside the church, were both members of Tacket Street Congregational Church in Ipswich. Each Sunday, they would load up their carts, and take their employees off to chapel. 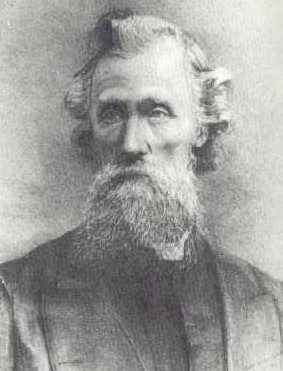 Akenham sexton Henry Waterman could rightly claim in 1878 that he was the only Anglican churchman left in the village. Then, as now, it was left to the people of the parish to elect a churchwarden; unsurprisingly, it was usually a local landowner, and the people here elected Mr Smith of Rise Hall, despite the fact that he wasn't an Anglican. Equally unsurprisingly, Father Drury refused to recognise the appointment (although it was recognised by the Bishop of Norwich) and also refused to allow Smith to hold the keys to Akenham church. Every Sunday, Father Drury set off across the fields to hold a service at Akenham church. It is still possible to walk this journey between the two churches along a bridleway - it is less than a mile. He would wait by the gate; if anyone turned up, he would unlock the church, go in with them, and a service would be held. Otherwise, he turned back across the fields to his rectory at Claydon. Estimates varied as to how often there was a service here; Drury guessed once or twice a month, but locals claimed no more than four times a year. It is important to remember that, in Canon Law, Drury was not allowed to hold a service without a congregation. The Sexton did not count. Ironically, this legislation was often used against Anglo-catholics like Drury, to stop them saying private Masses. It was, and is, the responsibility of the churchwarden to ensure the upkeep of the church. 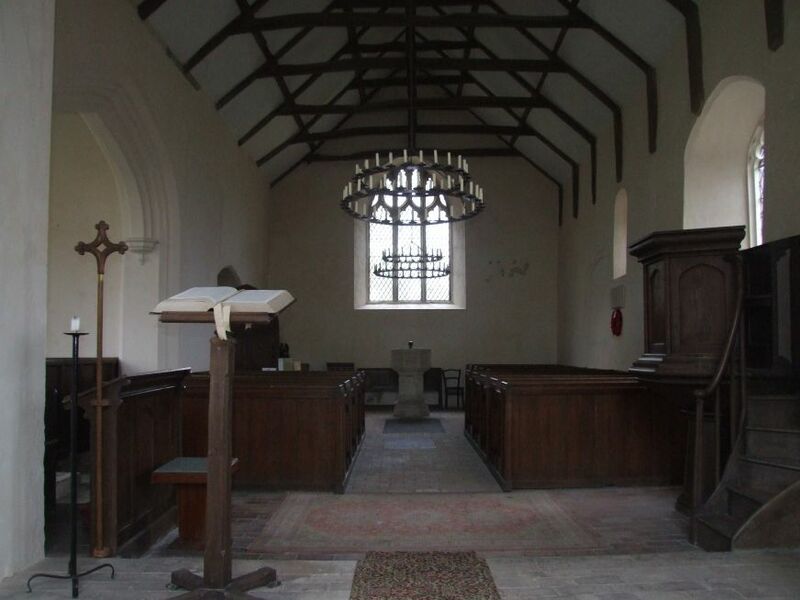 But, since Drury refused to recognise Smith as warden, and denied him access, the inside of Akenham church was in a dreadful state - dirt, decay and dead birds. This state of affairs suited both parties; from Drury's point of view, it reinforced the impression that there was no warden. From Smith's point of view, it showed the results of Drury's stubbornness and High Church fundamentalism. On top of all this, a further pointed inflamed Akenham feeling against Drury. Although Claydon was by ten times or more the larger parish, Drury received a stipend of just £240 a year for his vicarship there. By contrast, he received £266 a year for fulfilling the same role at Akenham. This anomaly was not unusual in the 19th century, and was the responsibility of the patron who presented to the living. In the case of Claydon and Akenham, this was the Drury family themselves. The whole thing, then, was a powderkeg waiting to explode. The fuse was lit in a quite unexpected manner. Shortly before 5pm on Friday 23rd August 1878, Drury set off along the bridleway towards Akenham church to bury a two year old boy, Joseph Ramsey, son of an employee of the non-conformist Mr Gooding of Akenham Hall. Drury had been told during the week that the boy's parents were Baptists, and he was therefore unbaptised (Baptists practicing adult baptism). The only difference this would make to Drury would be that, in Canon Law, he was not allowed to read the Book of Common Prayer burial service over the coffin of an unbaptised person. It is important to note that it would actually be an offence for Drury to read the service even if he had wanted to; moreover, he was already in a lot of trouble with his Bishop. However, Drury would still expect to accompany the coffin from church gate to burial site, and be present at the interment. Unbaptised infants were traditionally buried on the north side of the churchyard. This tradition was maintained here by Henry Waterman, the sexton, who seems to have taken a dark pleasure in informing the Ramseys of this arrangement, allegedly telling them that their son would be buried 'like a dog'. In most churchyards, the north side of the church is not as severely cut off as it is here. However, contrary to popular belief, this was not unconsecrated ground. That many people believed the ground to be unconsecrated emerged at the later trial. What happened when Drury arrived at the church is unclear, and depends on whose evidence you read. What all agree on, however, is that the little coffin arrived accompanied by an Ipswich Congregationalist minister, the Reverend Wickham Tozer of St Nicholas Street Chapel. Also present were the two main landowners of the parish, Mr Smith and Mr Gooding, and a crowd of 20 or 30 farmhands, mostly members of one or other of the Ipswich non-conformist chapels. Rev. Tozer tried to hold a service at the edge of the field across the track from the churchyard gate (a field owned by Mr Smith of Rise Hall). Drury approached the group. He claimed that this was to take charge of the coffin and accompany it to the grave. They claimed that he attempted to break up the service. Whatever, both sides agreed that firm words were spoken, the Rev. Tozer waving his fist in Father Drury's face. Both sides agreed that Drury gestured towards the coffin with his umbrella, and that the parents implored Rev. Tozer to ignore Father Drury. Both sides agree that Drury eventually stormed off without burying poor Joseph Ramsey, unwisely locking the churchyard gate before he left. The others then conveyed the coffin through the hedge and buried it, but made it clear that they had not held any form of service in the churchyard. For the Canon Law that prevented Drury reading the burial service over an unbaptised infant contained another, even harsher clause. This was that it was an offence in the eyes of the law for a clergyman from another denomination to read a burial service of any kind in a Church of England parish churchyard. Now, given that 95% of burials at this time (and almost all outside the great cities) took place in CofE graveyards, this was an increasingly harsh piece of legislation. At that time, there was a great lobbying of parliament for a change in the law; after all, if an Englishman abroad could be buried in a Catholic or Orthodox graveyard with the service of the Church of England, why could not a Catholic, Orthodox or non-conformist corpse receive the rites of its own tradition in this country? A Burials Reform Bill was talked up in all parts of the land, as a way of putting right this injustice. Some non-conformist chapels had their own burial grounds (as at Tacket Street, for instance), but there was none in Akenham; none in Claydon, where there wasn't even a non-conformist minister. In normal circumstances, the free church dead would receive a service in their own chapel before being conveyed to the grave. 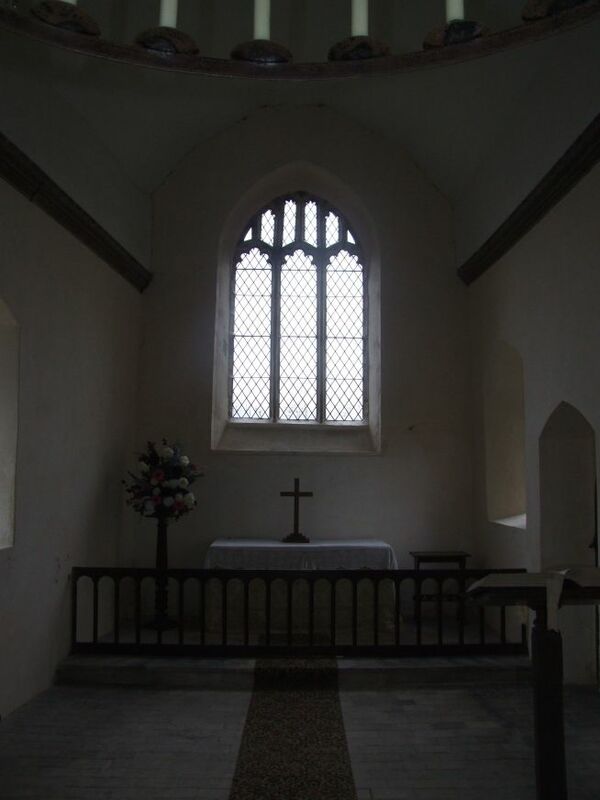 In a place like Akenham, where there was no chapel, that service might take place at a cottage. But the service in the field over the corpse of Joseph Ramsey was quite unprecedented. Although there was no law against it, it was a wholly unusual situation - as unusual, in fact, as such a great crowd being at the funeral of an infant from a working class family. One presumes that Drury went back to his comfortable rectory, seethed for a while, and then forgot about what had happened. However, on the Monday Morning, he received a nasty surprise. A detailed account of the incident appeared in the East Anglian Daily Times, the local newspaper that had the largest circulation. This seemed to have been written by a witness. Had one of the crowd been a reporter? How did he come to be there? The report accused Drury, amongst much else, of trying to prevent a Christian burial, and of saying in response to Tozer's entreaties that "religious convictions... and feelings have nothing to do with it - your proceedings are altogether wrong and I must teach my parishioners that I cannot sanction them". It accused him of saying that the child was not a Christian, and of storming off, locking the gate, when Tozer refused to cut short his service. Tozer had told Drury to go to Heaven, the report continued, but instead he had gone to Claydon, which "as far as the rectory and adjoining nunnery are concerned, is a very different place". It concluded with the editorial comment: "We leave the facts to tell their own tale, reminding our readers that this staunch upholder of ecclesiastical law is already under admonition from his own bishop for lawless proceedings in his own church.." Late 19th century readers would have immediately understood this to mean that Drury was guilty of High Church practices. The report seemed carefully calculated to provoke some sort of response from Drury. Whatever, Frederick Wilson, the editor of the East Anglian Daily Times, seems to have thought legal action likely. Wilson wrote letters to several people concerned with burial law reform, suggesting that they might finance his costs in any court case. "Such an action would do more to further the burials bill than any step I can imagine", he wrote to Tozer. "I trust the friends of religious liberty, now so thick around you, will come forward to help us. I want to form a guarantee fund of £500 to defend this action, and if he brings it, to attack him simultaneously under the Public Worship Act." This was the legislation that prevented Anglo-catholic priests from introducing ritual into their churches, on penalty of imprisonment. "If there is any bottom in this talk about the Burials Bill, there should be no difficulty in getting plenty of money to fight such a cause." Well, Drury had the courage to sue, and sue successfully, Frederick Wilson for libel. (In English law, it is the publisher rather than the author of a piece who is liable). However, the jury only awarded Drury damages of 40 shillings plus costs, thus presenting a moral victory to Wilson, and, by extension, to Reverend Tozer, Smith and Gooding. During the trial, a number of curious facts emerged. Firstly, Tozer was not the Ramseys' minister. In point of fact, he had never met them before. He had been asked to conduct the 'impromptu' service by Smith and Gooding, who had known that Tozer was an experienced journalist. Furthermore, Smith and Gooding were both related to the editor of the Christian World magazine, which would quickly pick up the story as though from an authoritative source, and gleefully run with it. Tozer would surely have thought it odd when he arrived to find a group of 20 to 30 farmworkers present, as well as the two leading landowners of the parish. An infant burial, after all, was a wearily common occurence. Tozer himself stated that he had buried ten of his own children. But it also emerged that the two landowners, Smith and Gooding, had asked Tozer to compile the written account of the proceedings, a request with which he complied. He had incorporated their contributions, and allowed them to correct the final draft. Was this a conspiracy, intended to discredit Drury's High Church practices? Or was it simply hoped to provoke a change in the law? Popular opinion remained against Drury. A national fund was set up to pay Wilson's costs, raising over £1000 (almost a quarter of a million in today's money). A small amount of this went to provide a proper headstone for the little boy. 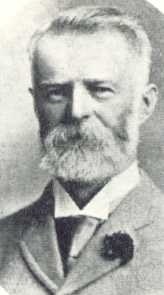 Drury soldiered on at Claydon until his death in 1895. In the 1970s, the writer Ronald Fletcher discovered a scrapbook of press-cuttings about the incident in a Southwold junkshop, and put together an excellent account of the scandal in his book The Akenham Burial Case. He also wrote about it in In A Country Churchyard. His books show that the incident led directly to the passing of the Burial Law Reform Act of 1880. There's no question that this popular change in the law was bought at the expense of George Drury's reputation. 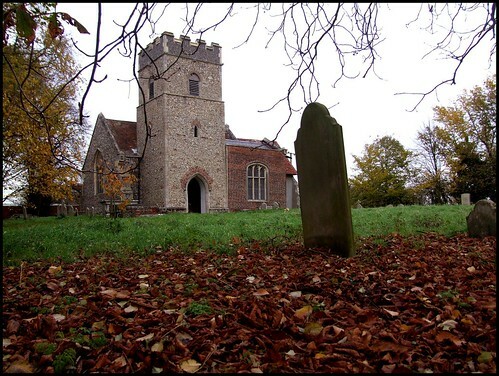 As recently as 1980, the Redundant Churches Fund guide to Akenham church stated that 'this churchyard was the site of a famous incident in which the rector, George Drury, refused to allow the burial of a child of non-conformist parents'. Mortlock's guide also repeats this charge; but Drury was not at the time accused by Tozer of this, and certainly strongly refuted any suggestion at the trial that he might have considered such a course of action. Perhaps the confusion arises from a misreading of Fletcher's books, since I have not found it in any guide in the intervening years. And so, we stand outside the gate, at the very spot where Joseph Ramsey's coffin rested. On the other side of the track is a gate into the field where the incident took place. Beyond, Rise Hall sits in a dip. We open the gate, renewed since the unfortunate afternoon that Drury, in his anger, locked it against the burial party; but the gateposts are the very same ones. The church, on rising ground, presents a slightly curious aspect. The 14th century tower is a south one, common enough in the Ipswich area, but a 17th century brick mausoleum has been built to the east of it, today forming a south aisle. From the east end of the aisle, two modern steel joists protrude, a reminder of another unhappy day in the life of this church. In 1940, a German bomber, returning from a foray over a Midlands city, dumped the rest of its load here before the hazardous crossing of the North Sea. A mine hit St Mary directly, wrecking the building. 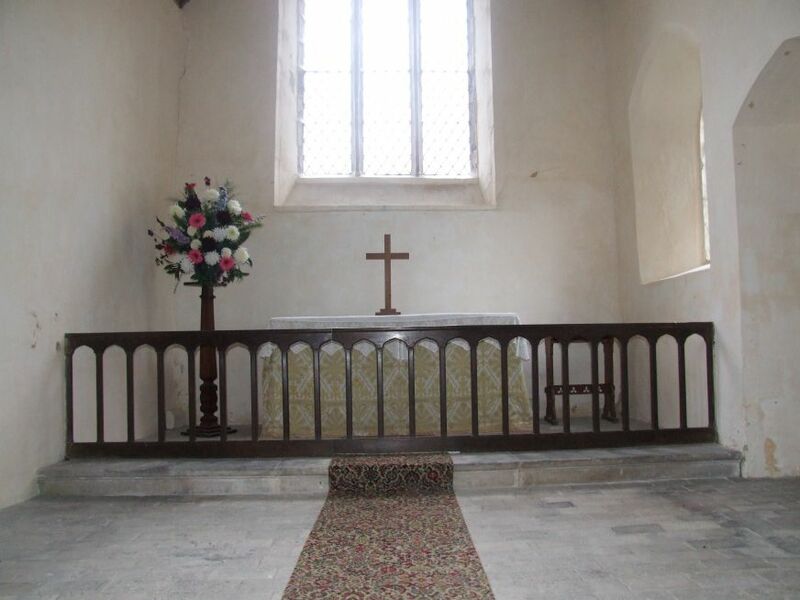 It remained derelict until the 1960s, when the energy and enthusiasm of the local people, and the resources of the Friends of Friendless Churches, rescued the little building and restored to use, as part of the benefice of Whitton and Thurleston. In 1976, the Anglican Diocese declared it redundant; not, perhaps, unreasonably. 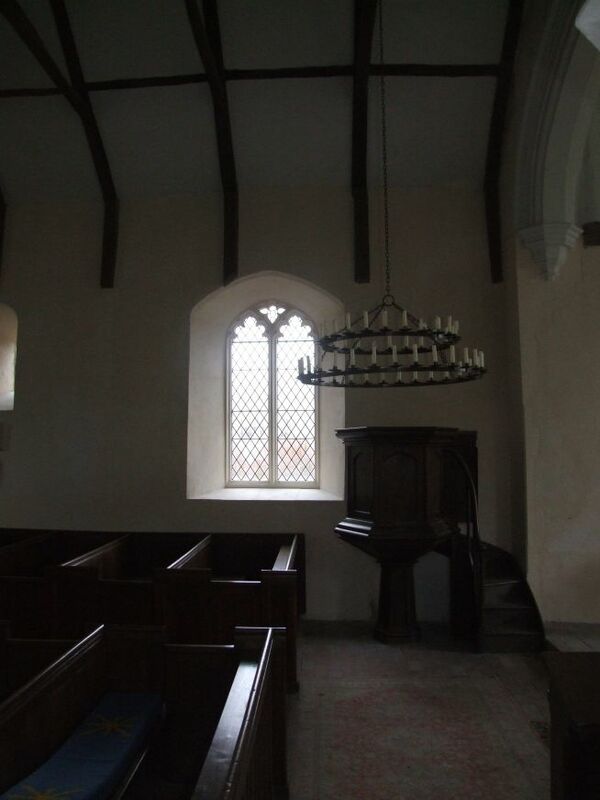 It was vested in the care of the Redundant Churches Fund, now the Churches Conservation Trust. The Tower is rather a bare one, but the whole thing together is so pretty that one can forgive this. The interior is bare in the CCT manner, and neater than in Drury's day. He probably designed and made the pews with his own hands. As if the sense of melancholy has infected the building, there are two other moving features not associated with the burial case. 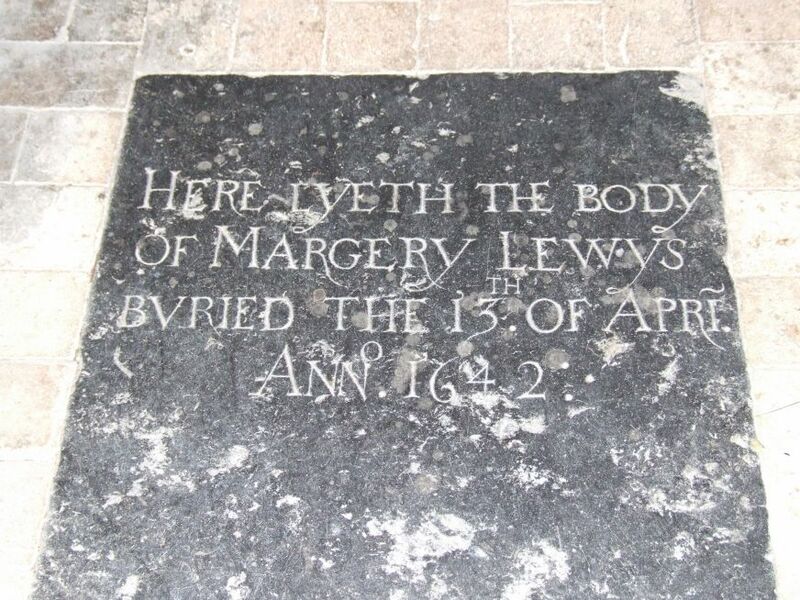 For seveanteen more beeing marriid liv'd a wife. And as I liv'd, I dy'd, belov'd, bewail'd. There are a couple of curiosities. 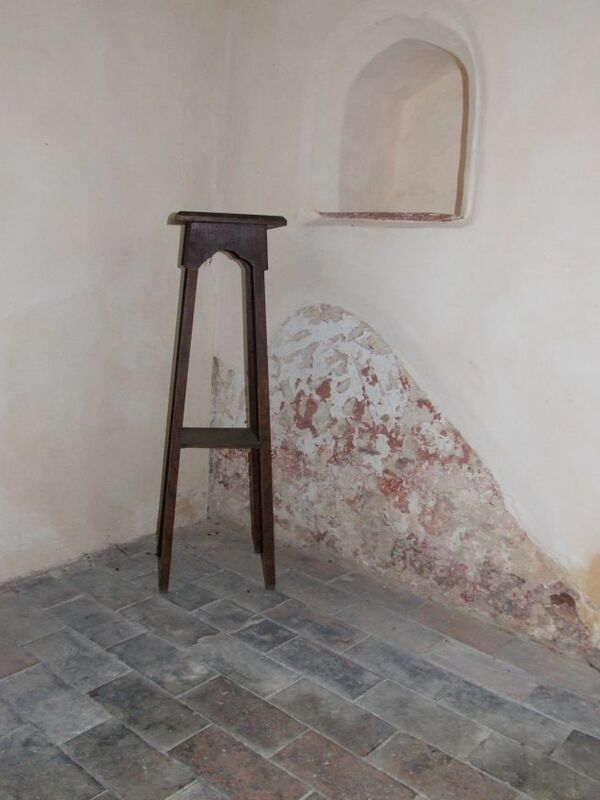 In the chapel, which is clearly post-Reformation, there is a medieval piscina. Was it placed there, as seems likely, by Firm Father George? Or was it there already, the the aisle built on the site of an earlier one? Just inside the door, there is a medieval brass inscription, asking for prayers of the soul of It seems an unlikely survival in puritan Ipswich - was it another of Drury's aquisitions? Like all CCT churches, Akenham is admirably cared for. The great irony is that the main custodian and keyholder is at Rise Hall, the farm where Drury's 'protestant churchwarden' Mr Smith lived, who was not allowed a key. The path between hall and church cannot have changed at all in the years since. Before leaving, there is one last thing to do. We walk round to the north side. A disconcerting corrugated iron fence separates the churchyard from a neighbouring farm. Here, there is just one gravestone, of the dozen or so that were here in the 1870s. It is Joseph Ramsey's, of course; the name is still decipherable. In 1978, Ronald Fletcher found this stone leaning against the wall; so it has been reset since then, perhaps not quite in its original place. On a cold winters day, with the wind furrowing the grass, it would be easily overlooked. It is very moving. I stood outside the gate, where this whole thing began, looking out towards the Whitton estate. The tower block of Thurleston High School dominates the horizon; this school, which serves the estate, is named after the vanished village of Thurleston, which was in the valley below. The ruined church of Thurleston was demolished in the 1860s to provide materials for the rebuilding of Whitton church. It is said that Drury used some of the masonry to construct a grotto in Claydon rectory garden. Electricity pylons criss-cross all the land round here. If Joseph Ramsey had lived, he might have seen them go up when he was in his eighties. I thought about how all of this happened more than a century ago, but that a century was not a very long time. When you are visiting, talking and writing about medieval churches, a century is a very short time indeed. I'd like to acknowledge my debt to Ronald Fletcher, and in particular his two magnificent books on the subject, In a Country Churchyard and The Akenham Burial Case.